There is one image of the last few days that has been haunting me. To date I have been unable to erase it from my mind’s eye. It is the rather disturbing vista of the right wing UKIP leader Nigel Farage trying to shake hands with President Elect Donald Trump. They pose for the press in the open doorway of an extravagantly decorated Golden Elevator at Trump’s palatial New York headquarters, Trump Tower. 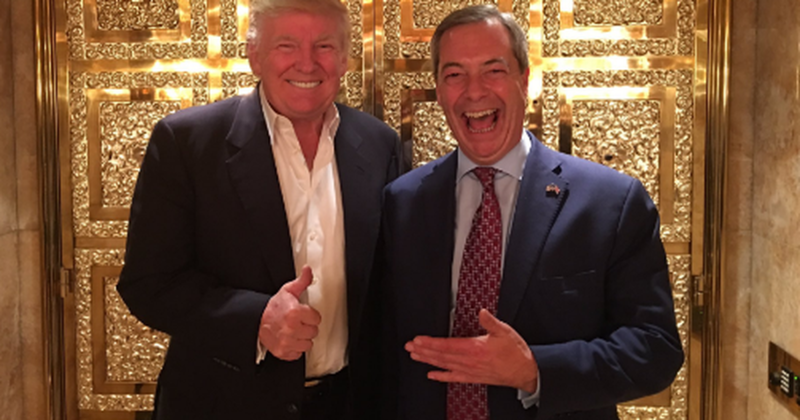 Nigel holds out a hand towards Trump and leers towards the camera. He has the look of a gleefully grinning velociraptor. Trump’s response is typically sociopathic. Despite this being a crowning moment in Farage’s career, Trump wants to remind the UKIP leader and the rest of the world who is actually the boss. Let there be no doubt, nobody trumps Trump and instead of offering a warm and friendly handshake, The Donald returns a thumbs up directed to the jostling media pack outside. Trump’s reluctance to shake hands is in part due to being a self-professed germophobe. He is known to have an intense dislike of making physical contact. For me, both men are the manifestation of a broken political system. This image seems to capture the opening moves of a deceit that is about to play out for those that were duped into thinking they were voting for change. Both men claim to represent the working class, they stand against the elitist agenda of taxing the poor for the benefit of the wealthy. Both men claim to understand the frustrations of ordinary hard working people who have seen there jobs sold off to China and Mexico. However, the glittering, golden lifestyle they openly embrace could not be further from those they seek to represent. In Nigel’s case, we should not be too surprised. Hypocrisy is after all what the UKIP leader does best. True to his word, Nigel Farage has set in motion the first few steps towards the total destruction of the European Union, whilst at the same time continuing to draw the salary and benefits of a Euro MP. His right wing views on immigration and petty nationalism helped propel British voters to shoot themselves in the foot by turning their back on 70 years of peaceful trade with EU. The next Hermit State? Is North Korea our best hope for a trade deal now the UK has turned its back on Europe? Alongside North Korea’s Kim Jong-Un the UK are busy pulling up the drawbridge, clamping the borders firmly shut and turning their backs on Europe. Theresa May is busy helping Britain create the new ‘hermit state,’ a land that will once gain regain its independence and is now locked in a race to the bottom of the heap. 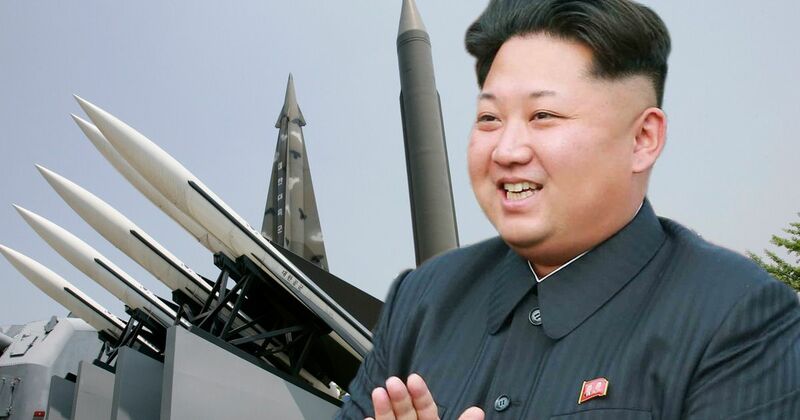 The UK even has US approved nuclear missiles and who knows, maybe if things get totally screwed, The Donald may even let them launch. The UK referendum resulted in a vote to leave, but the worry is that even the most optimistic forecasts suggest a bumpy road ahead. According to official figures Britain can now look forward to eye watering government debt which in return will lead to no wage growth in real terms for the next 10 years. This isn’t the change we were promised during the ‘Leave’ campaign, neither was there any mention of a near 20% devaluation of sterling. The very austerity people thought they were voting against, will now be set in concrete by a less than sure footed Theresa May. The perfect replacement for a feckless Mr Cameron whose final act as Prime Minister was to shamelessly award 62 former aides, donors and senior Remain campaigners peerages, knighthoods and other titles. One could be forgiven for thinking that the reason for BREXIT was to prevent unelected bureaucrats telling ordinary people in the UK what to do, yet here we are. The very person charged with carrying out this act of vandalism has never received a single vote from the British people. She actively seeks to deny any kind of democratic process to debate or have a say in exactly what type of exit from Europe the UK is going to have. Instead the ex Home Secretary reads from an ill prepared script and is leaden and unresponsive to the questions of parliament and the media. Meanwhile, we can all be sure that a 369 million refurbishment of Buckingham Palace and the commission of a 120 million replacement Royal Yacht will continue at pace and will be funded by the public purse. Trump, May and Farage have made it clear that they see the issue of jobs being lost to countries such as China as one of immigration. What kind of twisted logic is that? Both the UK and America were built on immigrant labour. The Statue of Liberty is a stoic reminder of US ancestry. Trump himself was born of immigrant Germans and as most school children should be able to tell you, the UK was built on the wealth of slavery and exploitation of the Common Wealth. Here in lies my point. None of this self inflicted hardship is going to impact on the lives of Donald Trump, Nigel Farage or Theresa May as they are already massively wealthy. This leads one to ask the obvious question, what are they getting in return, if it is not only about the money? What do they most deeply desire? If you were to ask them, they would no doubt tell you that it is their selfless love of country. I don’t think we will have to wait too long to see how that pans out. For now, we are reminded that US President Elect Donald Trump is there to “make America great again.” The slogan plagiarized from former US President and Hollywood star Ronald Regan has a ring of triumphalism about it. They are words that can at times sound a little hollow. How much more reassuring would it be if it was an ex car worker or steel man that through the magic of the great ‘American Dream’ heroically found their way to the Whitehouse in order to make America great again. For the UK, we do not have any inspirational super villains in control for the time being, unless you include the Titanic success of one Boris Johnson who is at the helm of the Foreign Office. It would seem that he has already played his part in steering the mighty ship into the path of an iceberg and everyone on deck can be heard cheering. Clearly those that have manipulated their way into the corridors of power, are not there to enrich the lives of voters. Neither are they there just for the money. It is for the power and the glory. Money being a vehicle to achieve a far less noble objective. Only this time we could all get to share a ride in a Trump elevator. It will not be a golden elevator though, instead it could be the one that ends up free falling to the basement.